Achieving recovery of function and sound fracture fixation following distal humerus fractures in geriatric patients remains a challenge. Although the incidence of distal humerus fractures is low (2%), their complexity poses a challenge in treatment.1 Common problems with distal humerus fractures include their intra-articular and comminuted nature and their predilection toward osteoporosis. The 2 most common repair strategies consist of open reduction and internal fixation (ORIF) and total elbow arthroplasty (TEA). Previous studies comparing these techniques have not reached a consensus as to whether one is superior to the other in the fixation of distal humerus fractures. Prior meta-analyses and comparative studies have compared outcomes of these 2 repair strategies. A meta-analysis and systematic review by Githens et al3 in 2014 was the first to report on ORIF vs TEA in the treatment of distal humerus fractures. Complication rates and outcomes from 27 studies were analyzed, and there was no statistically significant difference in either parameter for TEA vs ORIF.3 Previous studies of TEA vs ORIF have reported similar complication rates but better functional outcomes and reduced surgical time, hospital stay, and rehabilitation time for TEA.5–7 However, the ORIF cohort used in those studies often included cases that predated the use of locking plate and screws, anatomically contoured plates, and updated fixation techniques, which have become the mainstay of fracture fixation of distal humerus fractures. Therefore, the aim of the current study was to provide an updated meta-analysis examining outcomes following distal humerus fractures undergoing either ORIF with newer plating strategies or TEA in patients older than 60 years. 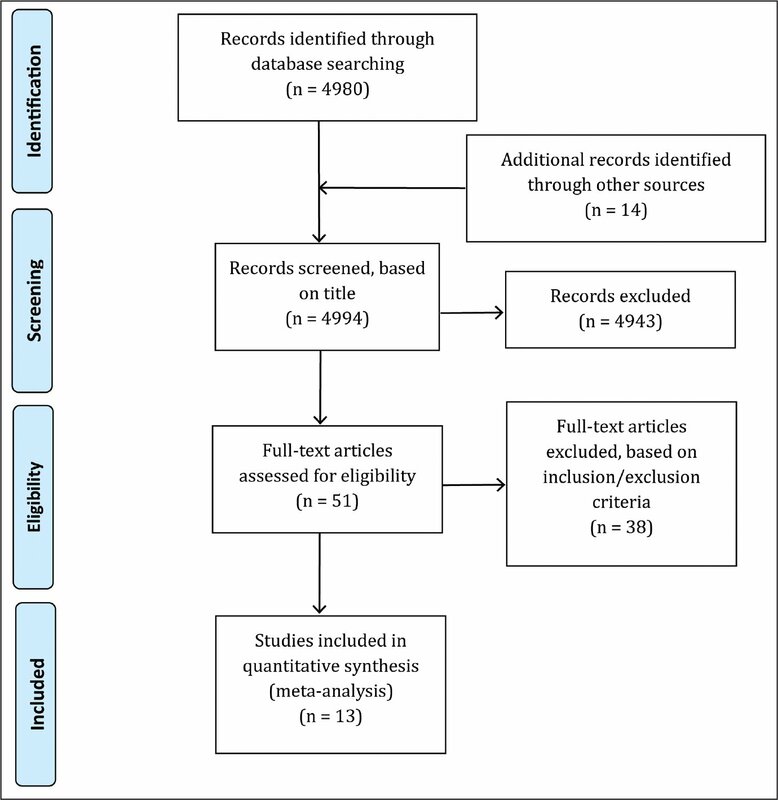 A systematic literature review was performed in accordance with the Preferred Reporting Items for Systematic Reviews and Meta-Analyses statement. PubMed and Cochrane databases were searched using the keywords “humerus,” “fracture,” and “elderly.” The search was kept broad to capture all relevant literature. All articles in print or Epub ahead of print were captured. Publications were sorted by date to prioritize recent literature. The search included articles from 2009 through October 2017. Articles were selected based on exclusion criteria by 1 author (L.E.S.). Articles were sorted by recent first to capture newer articles. Initial screening was based on article title, and all articles that were thought to be relevant to the current study were included. After initial screening, further selection was performed based on inclusion and exclusion criteria, inferred from the abstract. 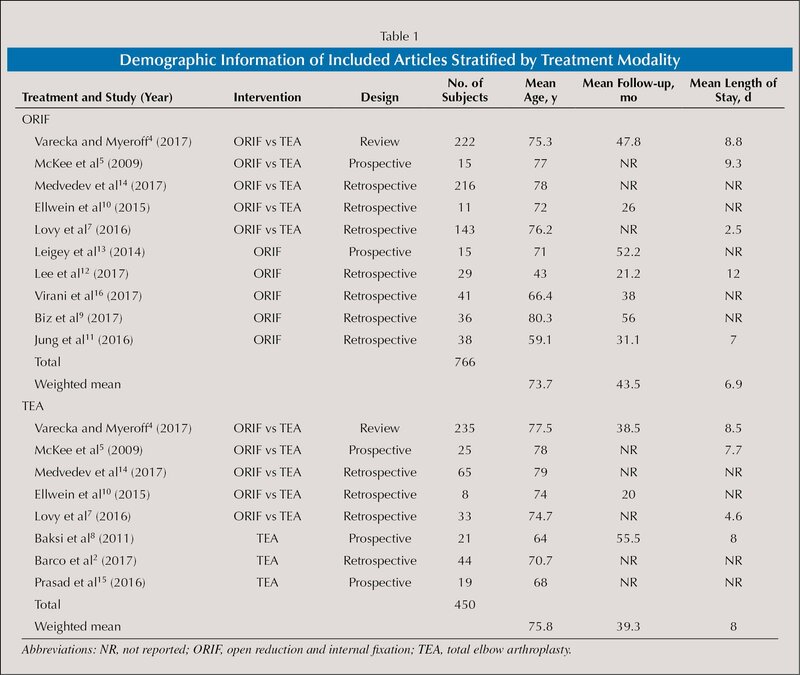 Studies meeting inclusion criteria were observational cohort studies, randomized controlled trials, or review articles that provided functional outcomes and complications for patients older than 60 years with distal humerus fractures treated with ORIF or TEA. Exclusion criteria included mean age younger than 60 years, use of nonlocking plates in ORIF cohorts, and incomplete data reporting. Studies were then selected for full-text review. Standardized data extraction was performed. Data from all studies were weighted and combined and compared across the 2 treatments using generalized linear models in the Statistical Package for the Social Sciences version 23 software (IBM, Armonk, New York). Continuous outcomes for the 2 treatments included age, follow-up, length of stay, flexion arc, extension, flexion, Mayo Elbow Performance Score (MEPS), and Disabilities of the Arm, Shoulder and Hand score. These were analyzed, and weighted means were computed and compared across treatment groups using a generalized linear model specifying a normal distribution. Standard errors and 95% Wald confidence intervals (CIs) were calculated. Categorical outcomes included total complications, rate of reoperation, contracture release, superficial infection, neuropraxia, heterotopic ossification, symptomatic implants, and implant failure. The number of events was compared across treatment groups using a generalized linear model specifying a binomial distribution. Standard error, odds ratio, and 95% Wald CI were calculated. Complications unique to TEA, radiographic loosening, periprosthetic fractures, and nonprogressive radiolucency, were extracted but could not be compared with ORIF. The initial search identified 4980 records using the keywords. An additional 14 records were found and included from references or cited sources on PubMed. A total of 4994 records were screened based on title; 4943 records were excluded because they were irrelevant to the topic, not in English, or older than 2009. Fifty-one studies were selected for full-text review. Thirty-eight were eliminated for failure to meet inclusion criteria. Ultimately, 13 studies were included in the final data analysis.2,4,5,7–16Figure 1 details the database search and study selection process. Preferred Reporting Items for Systematic Reviews and Meta-Analyses database search and study selection process. Of the 13 studies that met inclusion criteria, 5 analyzed ORIF vs TEA, 5 investigated ORIF only, and 3 investigated TEA only. Overall, there were 1216 patients (766 ORIF and 450 TEA). Demographic data for ORIF and TEA are presented in Table 1. Compared with ORIF, patients who underwent TEA trended toward being older (75.8 vs 73.7 years, P=.547). Mean follow-up was 43.5 months after ORIF vs 39.3 months after TEA (P=.428). Length of stay in the hospital was greater after TEA than ORIF (8 vs 6.9 days, P=.506). There was no statistical difference between ORIF and TEA for these variables. Functional outcomes are summarized in Table 2. Mean flexion arc, defined as the average of the total degrees of range of motion of each patient studied, was similar in TEA and ORIF (100.7° [95% CI, 97.7°–103.0°] vs 103.0° [95% CI, 100.3°–105.2°], P=.179). Mean flexion was also similar in TEA and ORIF (125.4° [95% CI, 120.7°–130.5°] vs 123.1° [95% CI, 120.0°–127.9°], P=.612). Mean MEPS was superior after TEA as compared with ORIF (88.3 [95% CI, 85.7–91.0] vs 82.8 [95% CI, 80.2–85.4], P=.003). Mean extension was worse in TEA compared with ORIF (24.4° [95% CI, 19.7°–29.5°] vs 18.0° [95% CI, 11.5°–19.9°], P=.007). Mean Disabilities of the Arm, Shoulder and Hand score was also worse in TEA compared with ORIF (29.8 [95% CI, 11.6–48.0] vs 23.2 [95% CI, 15.2–31.2], P=.517). Mean MEPS and extension were found to have a statistically significant difference. 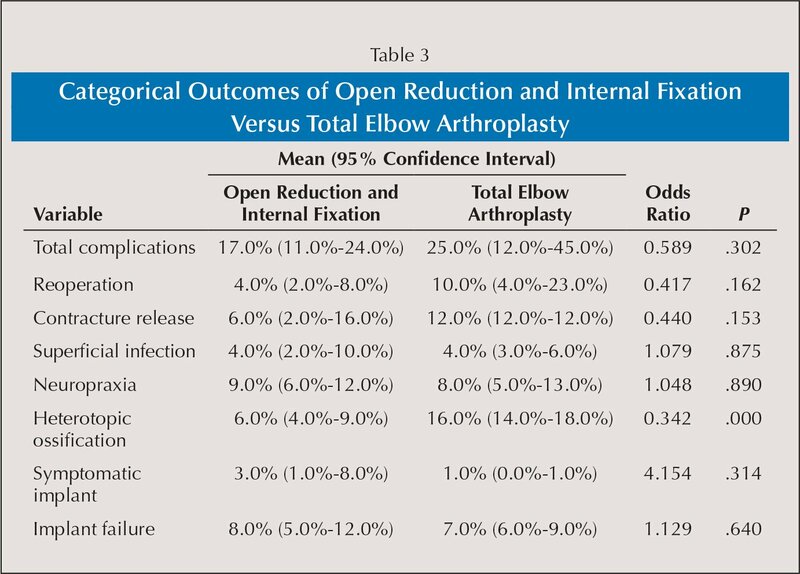 One included study4 had data only for flexion arc for TEA and ORIF that were not further stratified by elbow flexion and extension. These data were included for completion; however, this created a discrepancy in the calculation for mean flexion arc, mean flexion minus mean extension. Complication rates for ORIF and TEA are summarized in Table 3. Similar rates were observed; however, TEA had a significantly higher rate of heterotopic ossification (16.0% vs 6.0%; odds ratio, 0.342; P=.000). Total complication rate was lower in ORIF compared with TEA (17.0% vs 25.0%; odds ratio, 0.589; P=.302). Rates of reoperation and contracture requiring release were higher in TEA as compared with ORIF (reoperation, 10.0% vs 4.0%; odds ratio, 0.417; P=.162) (contracture release, 12.0% vs 6.0%; odds ratio, 0.440; P=.153). The rates of superficial infection and neuropraxia were similar in the 2 groups: 4.0% superficial infection after TEA and ORIF (odds ratio, 1.079; P=.875) and neuropraxia of 9.0% after ORIF and 8.0% after TEA (odds ratio, 1.048; P=.890). Symptomatic implants and implant failure were higher with ORIF vs TEA (3.0% vs 1.0% and 8.0% vs 7.0%). Complications unique to TEA included radiographic loosening, periprosthetic fracture, and nonprogressive radiolucency (Table 4). Radiographic loosening occurred at a rate of 7.0% (95% CI, 2.0%–22.0%), periprosthetic fracture at 3.0% (95% CI, 1.0%–16.0%), and nonprogressive radiolucency at 15.0% (95% CI, 10.0%–21.0%). The management of distal humerus fractures in the geriatric population continues to be a point of contention. Treatment of distal humerus fractures consists mainly of ORIF and TEA, although the data remain inconclusive as to whether one is superior to the other. Previous literature on ORIF vs TEA for the treatment of distal humerus fractures has shown that the complication rate and functional outcomes are similar.3,7,14 However, since these studies were published, there have been advances in technology and technique, notably the use of locking plates for ORIF, warranting an updated review. The aim of this study was to provide an updated systemic review and meta-analysis of ORIF vs TEA in the treatment of distal humerus fractures in patients older than 60 years. 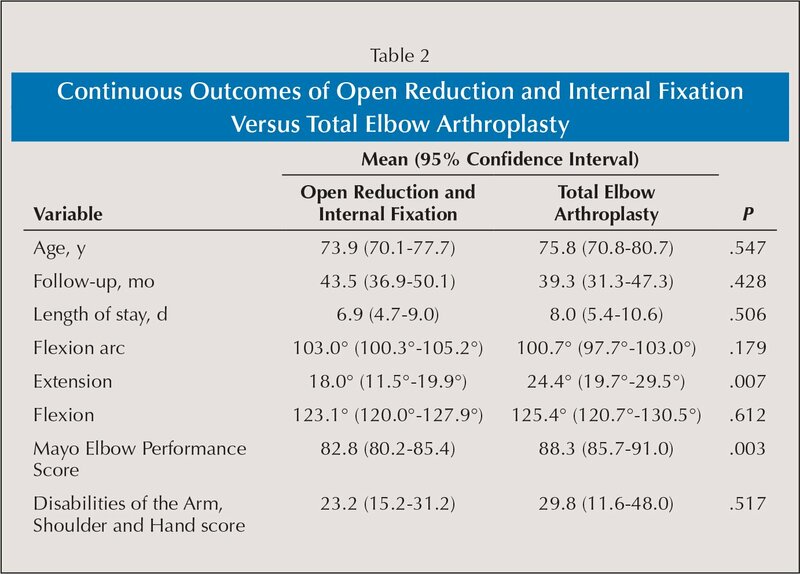 This updated meta-analysis found that there was a statistically significant improvement in elbow extension in the ORIF group, but distal humerus fractures treated with TEA had significantly higher functional outcome scores (MEPS). Additionally, the ORIF group was found to have better Disabilities of the Arm, Shoulder and Hand scores than the TEA group, although these results were not statistically significant. A trend toward higher total complications rate was found for TEA; however, the only statistically significant difference was a greater rate of heterotopic ossification in TEA compared with ORIF. Despite the statistical significance, the authors would not consider these results clinically significant. Functional outcomes were not found to be significantly different between ORIF and TEA in a meta-analysis by Githens et al.3 The 1.5° difference in arc of motion in patients who underwent TEA compared with ORIF and the 2.5-point difference in MEPS favoring TEA were not thought to be clinically significant.3 This is in contrast to the current study, which showed a statistically significant increase in MEPS in TEA vs ORIF. This study also showed an increase in mean extension in ORIF as compared with TEA. However, the authors are in agreement that these differences were not clinically significant. Recent literature indicates that with the advent of updated ORIF technique, such as bicolumnar plating and locking compression plates, treatment of distal humerus fractures with ORIF leads to acceptable functional outcomes.9,11,16 The current study supports the evidence that updated ORIF technique leads to appropriate functional outcome scores and mean range of motion for the treatment of geriatric distal humerus fractures. Complication rates were higher after TEA compared with ORIF, which was also supported by the study by Githens et al3 (37.6% in TEA vs 34.2% in ORIF), although this was not a statistically significant difference. Recent comparisons of complication rates after ORIF vs TEA have indicated that there is no significant difference in outcomes between them.7,14 This suggests that the recent trend toward using TEA in lieu of ORIF because of high complication rates with ORIF should be reexamined. Limitations of the current study included the inherent nature of a meta-analysis, which relies on the quality of the studies from which the data are extracted. Because distal humerus fractures are relatively rare, studies of them have low power. This study was also limited by publication bias for the individual studies analyzed. The data reported in each study were limited by their heterogeneity. Not all of the studies reported a standard deviation or even a standard error for their results. Also, not all of the studies had each of the functional outcomes and complications that the authors set out to examine. There is an inherent bias in the reporting of functional outcomes, although the MEPS, Disabilities of the Arm, Shoulder and Hand score, and range of motion degrees are for the most part standardized functional measures. Finally, unlike ORIF, prosthetic arthroplasty techniques require long-term follow-up to determine true longevity and long-term complication and revision rates. As there continue to be updates in technique, technology, and literature regarding ORIF and TEA, it is important to reexamine these 2 approaches for the treatment of distal humerus fractures in the elderly population. With a growing body of literature, especially regarding long-term follow-up of TEA, evaluation of current outcomes can help in better understanding the appropriate use of ORIF vs TEA in the care of fractures. The current study, a systemic review and meta-analysis of updated literature on TEA vs ORIF for the treatment of distal humerus fractures in the geriatric population, showed that there were no clinically significant differences in functional outcomes or complications. On the basis of the current updated meta-analysis involving newer data and techniques, the authors found no early difference in the use of either ORIF or TEA in the management of distal humerus fractures. Therefore, choice of treatment should be based on patients' long-term demands and anticipated need for implant longevity. Virani SR, Sonone S, Dahapute AA, Panda I, Roy KD. Functional results of comminuted intra-articular distal humerus fractures treated with bicolumnar plating. J Clin Diagn Res. 2017;11(4):RC01–RC03. The authors are from The Rothman Institute at Thomas Jefferson University, Philadelphia, Pennsylvania. Drs Schindelar and Rondon have no relevant financial relationships to disclose. Dr Ilyas is a paid consultant for Globus Medical, is a paid speaker for DePuy, and receives royalties from Globus Medical. Correspondence should be addressed to: Lili E. Schindelar, MD, MPH, The Rothman Institute at Thomas Jefferson University, 125 S 9th St, Ste 1000, Philadelphia, PA 19107 ( research@rothmaninstitute.com).